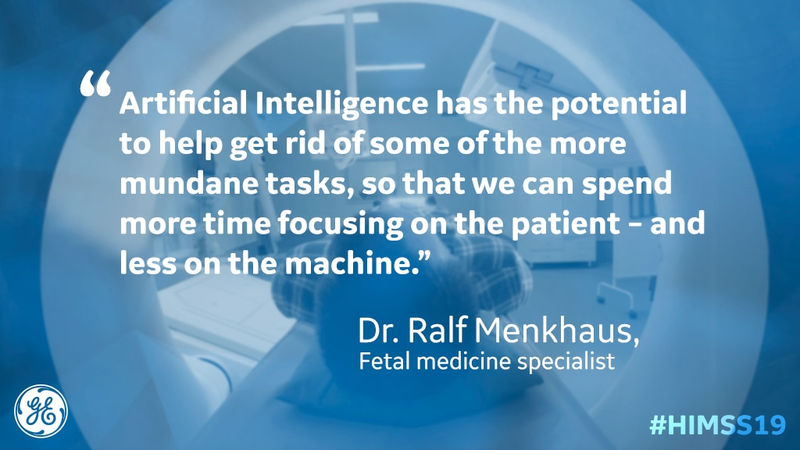 “AI has the potential to help get rid of some of the more mundane tasks, so that we can spend more time focusing on the patient – and less on the machine,” said Dr. Ralf Menkhaus, a fetal medicine specialist in Minden, Germany who has been using the Voluson E10 ultrasound on which SonoCNS runs. 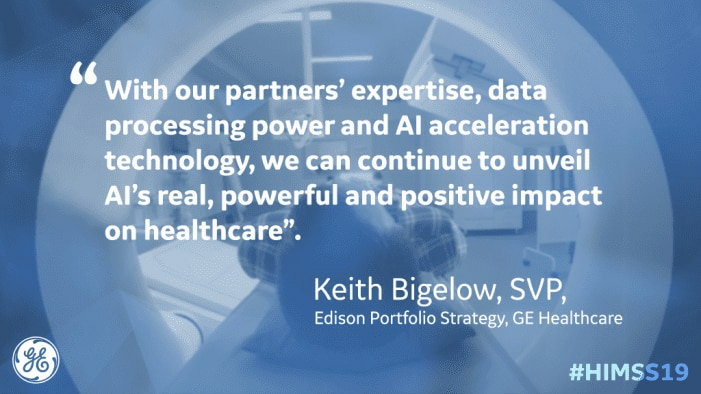 Part of GE Healthcare’s growing fleet of smart devices and applications, SonoCNS was built using Edison, an intelligence platform that can connect data from millions of imaging devices. According to the company, Edison has been quietly spurring analytics apps and AI-powered devices for the past few years. Like Dr. Menkhaus, other healthcare leaders are seeing success with the humble, methodical approach. For Chuck Sandoval, Enterprise PACS Program Manager at the University of Washington, he needed insights into how to improve operational efficiency across the enterprise. His team at the University of Washington deployed GE Healthcare’s Centricity Clinical Archive (CCA) Analytics to help uncover information regarding the hospital’s operation, capacity and usage of their enterprise IT systems. “CCA Analytics allows us to see which department and exams require process improvements to provide that critical clinical information while also helping us to understand, project and create an IT infrastructure plan for future budgetary cycles,” Sandoval said. Given that 64 percent of hospital executives project that their IT operating budget will stay the same or decline in the next year, tools like CCA Analytics can go a long way in helping leaders budget for IT resources based on data previously siloed in various departments. An Accenture survey of healthcare executives reinforces Bigelow’s response. Seventy-three percent of respondents ranked staff AI expertise in the top three greatest factors for successful AI implementation. Indeed, data science is a coveted skill among hospitals and healthcare companies alike. Standards like Stanford’s DAWN Benchmark provide a good indication of talent, bringing light to who can train AI models at the fastest speed and with the greatest accuracy. The benchmark, which measures who can deliver 93 percent accuracy for an AI model in the shortest time, sets the standard for AI excellence with each new record. Currently, GE Healthcare holds the best time , reaching 93 percent accuracy in 1 hour, 46 minutes and 20 seconds – 33 percent faster than the previous high. But successful teams are more than data scientists and the metrics they deliver. Collaboration – among clinicians, data scientists and engineers – has become the new normal in AI creation. An outcome of this clinical, technology and industry trifecta is GE Healthcare’s Critical Care Suite* on the mobile Optima XR240amx X-Ray system. The algorithm, which can alert the clinical team of potential pneumothorax cases as soon as the patient is scanned, was conceived in partnership with UCSF, developed with images and annotations from healthcare institutions all over the world, including St. Luke’s University Health Network in Pennsylvania, Humber River Hospital in Toronto, Canada, and Mahajan Imaging in New Delhi, India, and will be productized by GE Healthcare. When using Intel Distribution of OpenVINO toolkit, the GE Healthcare algorithm has the potential to accelerate pneumothorax detection within seconds of image acquisition. Underpinning all of GE Healthcare’s AI development is Amazon SageMaker, a fully-managed service from Amazon Web Services that enables data scientists and developers to quickly and easily build, train and deploy machine learning models. GE Healthcare says it was recently named a Global Strategic Alliance of AWS, meaning hospitals and health systems will continue to see these imaging and technology giants join forces for innovation.